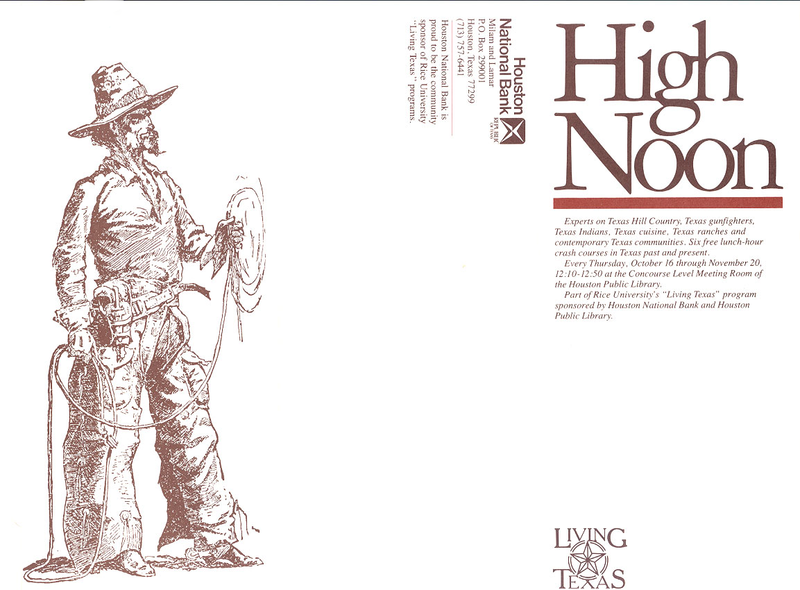 Emerging from the success of Living Texas, the “High Noon” lecture series presented similar content in a different format. Tailored for business professionals and other workers, the lectures were held over lunch in the auditorium of the Central Library downtown. 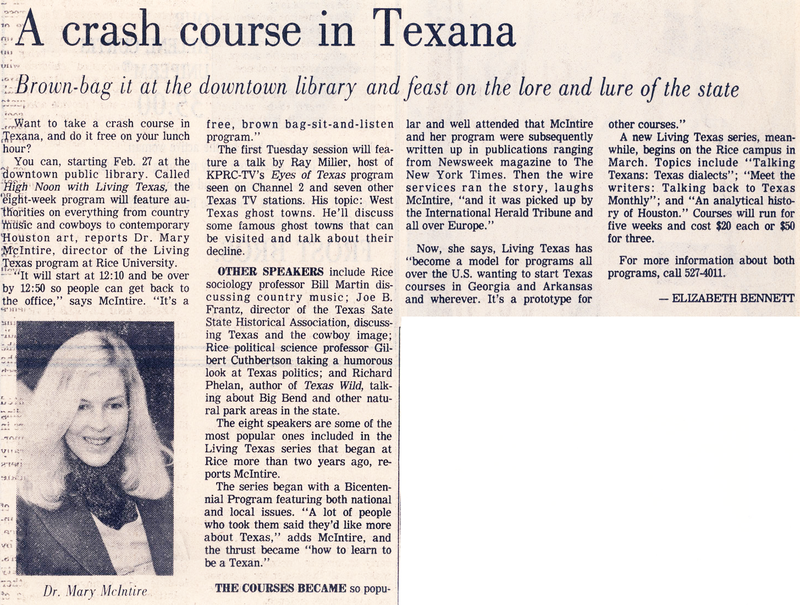 The lectures, which ran from 1979-1985, covered all things Texan and were presented by both Rice professors and outside experts. Attendees were invited to bring a lunch and listen up. Sponsored by the Republic Bank (previously called the Houston National Bank) and the Houston Public Library, the courses were free and open to the public. The lectures were presented in a series of five or eight. Dean Mary McIntire, then the program director, and Linda Driskill, the director of Continuing Studies, were also able to secure support from other local institutions, such as the Houston Academy of Medicine, the Texas Medical Center, which hosted a series, and the University of Texas-Houston Health Science Center. Lecture topics included, “Fashionable Tex-Mex Food,” “Television Evangelism,” “West Texas Ghost Towns,” “Texas and the Cowboy Image,” “High School Football in Texas,” “The LBJs” and “Texas Indians.” Ray Miller frequently kicked off the lecture series, delivering the first lecture and setting the scene for other Lone Star topics. Other lecturers included John Coffman, associate professor of geography at the University of Houston (Miller and Coffman would later lead the Waltz Across Texas tours); the assistant to the president of King Ranch, John Cypher; Richard West, senior editor of Texas Monthly; Joe B. Frantz, director of the Texas State Historical Association and Lynn Ashby, a popular Houston Post contributor. The series received significant coverage in the city’s newspapers and was highly attended. I think that at some point we were offering High Noon at four different locations throughout the city. The series was immensely popular, especially with business people and retirees. It raised the profile of our co-sponsors and helped to strengthen the reputation of Continuing Studies and Rice University as committed to community outreach.